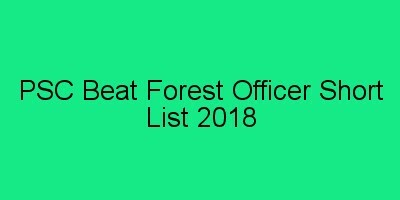 Kerala PSC conducted the Beat Forest Officer Exam on April 7th, 2018 (7.4.2018) at various centres for appointment to beat forest officer post in Forest Department. BFO Exam Shortlist (Category Number : 582/2017, 583/2017, 584/2017, 585/2017, 640/2017) will be available at www.keralapsc.gov.in Applied candidates can be download beat forest officer exam Shortlist from www.keralapsc.gov.in. Applied candidates can download beat forest officer Shortlist from www.keralapsc.gov.in.